Born: October 15, 1865 in Mansfield Ma. Died: March 11, 1934 in Bourne Ma. at 68 yrs, 4 mos, 24 d.
Married: June 18, 1884 in Mansfield Ma. 1. Emmie Augusta Dixon Nissen; (May 5, 1884 – 1967); Married Birger P. Nissen (1881 – 1937) (Marcellus Nissen & Davida Naeso) in Mansfield Ma. 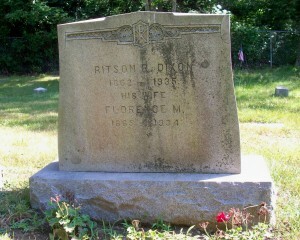 on November 12, 1912; Emmie & Birger are buried with the Dixon family in Pocasset Cemetery. 2. Donald Ritson Dixon, WW l; (August 27, 1891 – June 15, 1951); Married Hazel Goodhue (1895 – 1975); Hazel married (2) Peter McLeod (1891 – 1964) (Colin McLeod & Euphemia (–)) in Bourne Ma. on June 20, 1953; Donald & Hazel are buried in Pocasset Cemetery.